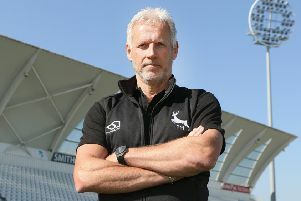 Nottinghamshire were left highly frustrated when rain forced their North Group T20 Blast match at Leicestershire to be abandoned before a result was possible. The Outlaws had posted a formidable target after being put in by the Foxes on a good pitch. At 98-0 off eight overs, it looked as though the visitors would threaten the record T20 score made against Leicestershire, 225-2 by Durham at Chester-Le-Street in 2010. Alex Hales, fresh from his destructive century off 47 balls in the previous game against Yorkshire, raced to a half-century off 26 balls, while Rikki Wessels needed only three more deliveries than his opening partner to go to his own 50, the highlight a 97 metre six over wide long leg that flew out of the ground and in to the garden of a terraced house. The introduction of the apparently innocuous off-spin of Colin Ackermann slowed the assault, however, not least because he quickly had Hales stumped off a wide delivery. Spin was also responsible for the fall of the next two wickets, with left-armer Callum Parkinson having Tom Moores taken at long-on, a good low catch by Aadil Ali, and in the same over dismissing Wessels, who had reached 63 when he top-edged an attempted reverse sweep and was held by Clint McKay back-pedalling from short third man. The Foxes’ bowlers continued to peg the Outlaws back, and in the 14th over South African left-arm seamer Dieter Klein bowled Brendan Taylor and Samit Patel with successive deliveries. In the end it needed Dan Christian’s 33 from 22 balls to see the visitors past 200. Rain had been falling intermittently throughout much of the latter part of the innings, and it became steady in the final over, causing a 90 minute delay. It relented sufficiently for the umpires to consider a re-start, with Leicestershire’s Duckworth Lewis target a notional 68 off 5 overs, but the rain returned just before the players were due back on the field.